When I was a kid and it was birthday time, you went to the stationery store and bought a pad of party invites. You filled in the blank lines by hand, folded the sheets in half and delivered them at school the next day. Most of the kids’ parties we go to these days are set up using Evite. It’s easy and free but oh so lacking in charm or creativity. And as a mom, if I can’t have fun planning a crazy, way-out-there birthday party, well, I’m just not having fun. I know — freak. 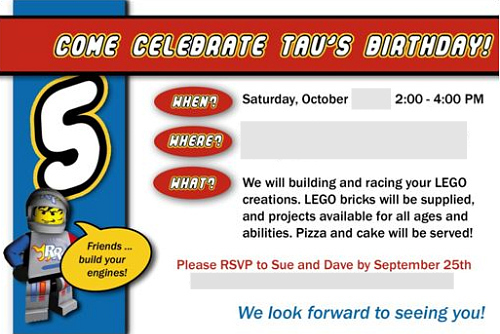 This is the first in a series of posts I’m going to do on the Lego party we’re having for Tau’s fifth birthday. The Internet is full of Lego party ideas and I thought it would be fun to add my two pennies, and also point to some of the great resources I’ve found. The invites were all my own idea. For the party, we’ve hired a local lady who comes to the venue with tubs and tubs of Lego and a 12-foot race track. The kids get to build their own vehicles and then race them on the track! So I wanted the invites to work with this theme. I found an image I liked and cracked open my very rusty Photoshop skills. I designed the invites as a 4×6 double-sided postcard, printed two to a sheet, and had them printed on cardstock at our local Office Depot. Hooray for Office Depot! A few other notes. I downloaded the Lego font from TypeNow.net and used the official Lego RGB colors for their Bright Yellow, Bright Red and Bright Blue. I had lots of fun doing these and was very pleased with how they turned out. I then got an email from Shutterfly offering me 10 free 5×7 greeting cards, and the small wheels in my head (or should that be the wheels in my small head) started turning. Who am I to pass up FREE?! So I started wondering how I could use that offer to print up some themed thank-you cards for after the party. Now all I need do is cut down the middle and we have 20 customized Lego thank-you cards for around the $5 I paid for shipping and handling. Way cheaper than anything you can buy in the stores! They arrived today and look great! 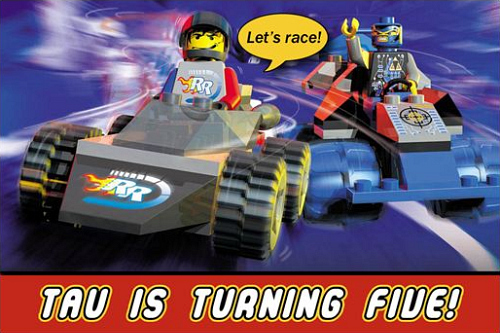 My personal fave, look at this incredible Lego tri-fold invite, halfway down the page! I’m using a few of Amy’s other ideas for Tau’s party but her invites were way beyond my skill level with Photoshop or Illustrator, and the colors she used in her printables were not the colors we’re using for the party — or, trust me, I would have bought them! This entry was posted in Crafty Crafty!, Digital Eye, Mister Kapister, Sue Stuff, Things that Make You Go 'YES!!! 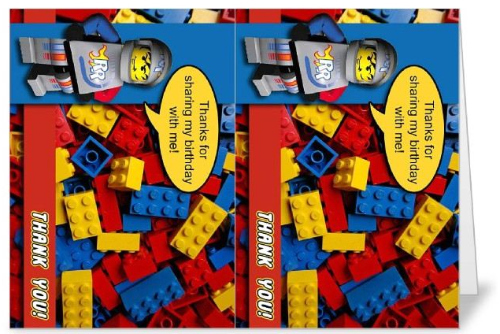 ', We Still Have Fun!, Why I Love the Internet and tagged birthday party, invitations, invites, lego. Bookmark the permalink. Please let me know how your party goes and I’d love to see pics. I lovee your invitations and decorations! We’ll be using some of your ideas for my 3 sons upcoming Lego party.I know you posted this almost a year ago but I have a quick question. I found the Lego font. But I don’t know how to download it and make it type with all the letters. Any suggestions? Thanks in advance! Any chance you’d be willing to share you THANK YOU note file!!! My son’s 6th birthday is on Valentine’s Day and I’m trying to get things in order!